Professor Tonio Andrade recently authored an opinion piece for The Washington Post examining brewing tensions in the South China Sea. Andrade, who published The Gunpowder Age: China, Military Innovation, and the Rise of the West in World History with Princeton this year, urges U.S. policy makers to reckon with the histories of Chinese expansionism in the Eastern Hemisphere despite past and present claims otherwise. Check out the excerpt below and read the full article, “For U.S. leaders, confronting China is a dangerous game,” here. What’s intriguing is that the timing of these bouts of expansive warfare was similar: They each occurred about 40 or 50 years after the dynasty was founded, after domestic control had been consolidated. And why did the Ming and Qing dynasties engage in such expansion after achieving domestic consolidation? In a word, security. In each case, leaders justified their military action with reference to China’s historic vulnerability. Only by achieving unquestioned preeminence in its hemisphere — or, as Chinese leaders put it, in the earthly realm — could China guarantee safety and security for its people. Expansion was meant to foster peace. The German newspaper Hannoversche Allgemeine Zeitung (HAZ) reported on third year PhD student Claudia Kreklau’s work on nineteenth-century food. The regional paper featured Claudia’s research at the World of Kitchen (WOK) Museum in Hannover. The archive welcomed the Emory student to gather data among their 7000-volume collection of cookbooks and ephemera, including various copies of the Practical Cookbook by nineteenth-century best-selling author Henriette Davidis, a vegetarian guide from the fin-de-siècle, and advertisements connected to the industrialization of foodstuffs. The wider collection houses objects of material culture which, along with Claudia’s findings of handwritten recipes, household diaries, and correspondence in the WOK’s manuscript collection, will contribute to her research on the development of German cooking traditions and questions of identity in the nineteenth century. Claudia Kreklau is advised by Dr. Brian Vick. The print version circulated July 7, 2016. E-version published July 10, 2016. Carol Anderson‘s The Unspoken Truth of Our Racial Divide (Bloomsbury, 2014) was recently reviewed by Jesse McCarthy in The New York Times. 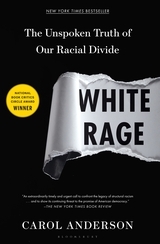 McCarthy’s review, titled “Why Are Whites So Angry,” appraised Anderson’s work as an “extraordinarily timely and urgent call to confront the legacy of structural racism bequeathed by white anger and resentment, and to show its continuing threat to the promise of American democracy.” Professor Anderson is Samuel Candler Dobbs Professor of African American Studies. Read the full review here.